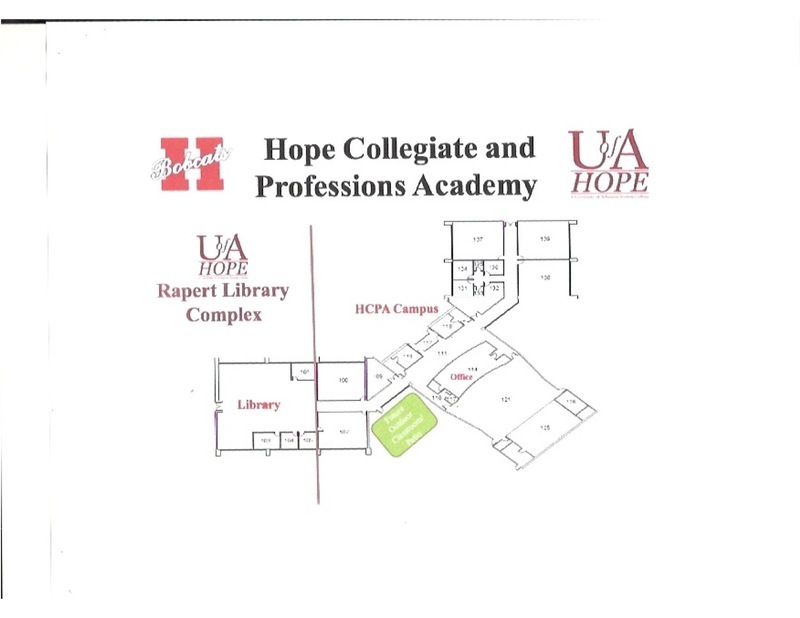 HOPE – Support was expressed from both the Hope Public Schools Board and the University of Arkansas-Hope Board of Visitors here Thursday night for the development of a standing grades 10-12 collegiate and professions academy on the U of A Hope campus in a re-purposed Johnny Rapert Library Complex on the U of A Hope campus. The concept was discussed in a joint informational meeting of the HPS Board and the UAHT Board of Visitors. “Rapert Library is the symbol of when this campus transitioned from Red River Vocational-Technical College to the University of Arkansas System,” U of A Hope-Texarkana Chancellor Chris Thomason told some 50 attendees in the Rapert Library auditorium. Thomason said the partnership already established between U of A Hope and the Hope Public Schools through a concurrent credit program signifies the gravity with which both entities view the opportunity for the unique plan. “At every juncture of our history, there has been the importance of our partnership with the Hope Public Schools,” he said. The concept calls for a direct collaboration between the HPSD and UAHT, housed on the U of A Hope campus, and intended to provide a rigorous college-level program of study for highly-motivated students in grades 10-12 that would produce a Hope High School diploma and a UAHT Associate’s degree at the end of three years. Classes would be taught exclusively by UAHT faculty, and a pre-planned course of study would be developed for each student. High school students would be integrated into college classes, with no more than 10 students per class. Students would segue into the full course of study through high school level AP/honors classes and some dual college credit courses. The final two years would consist of dual credit courses and regular college study. Thomason said HPSD students in the program would still be afforded opportunities in extra-curricular activities both at HHS and on the U of A Hope campus. He said the academy is to be housed in a remodeled Rapert Library Complex which provides independent entry to the academy apart from a redesigned library entrance. Classrooms, offices and the auditorium in the Rapert complex will be for the primary use of the academy, he said. Thomason said the Rapert Library will consist of a reading room, library stacks, and college book rental. Additional outdoor instructional space is also anticipated in the current preliminary designs for the building’s use, he said. Thomason said the concept is based on the Northwest Florida State College High School which the UAHT administration and staff have studied. He said the Florida model incorporates five high schools, while the Hope Collegiate and Professions Academy is exclusively focused on the partnership with the Hope Public Schools. “We believe one collaboration with one high school is a much stronger model for success,” Thomason said. HPS Superintendent Bobby Hart said the concept would be developed through a “conversion charter” for the academy, bringing Hope High School directly into the model. He noted that statistics have shown both Arkansas and Hempstead County are behind in the level of educational attainment. “There is a direct correlation between education and income,” Hart said. He said Arkansas currently ranks 48th nationally in the percentage of its population with college degrees or certifications, with median income of $41,262 annually. Hempstead County is 62 among 75 counties in college-level attainment, with annual median income of $32,122. Hart said the collegiate and professions academy “conversion charter” is a means to change the arc of outcomes for Hope and Hempstead County for the next generation. Hart said the Hope Collegiate and Professions Academy is designed for students living in the Hope Public School District. Hart said the current timeframe for obtaining a bachelor’s degree is five years because of costs, which often require students to work, class scheduling, and family circumstances. “Think of the economic potential we’re giving our students at the age of 18,” he said. UAHT Dean of Institutional Effectiveness John Hollis said the plan was worked out by a committee including himself, Hope Academy of Public Service Principal Dr. Carol Ann Duke, Yerger Middle School Principal Josclyn Wiley and UAHT Institutional Research Officer Danita Ormand. Hollis said, if begun now, approvals from the Arkansas Department of Education and the Arkansas Department of Higher Education would mean that the process could be completed by late 2018 or early 2019. He said the mission and vision for the academy have been taken from those of both UAHT and the HPSD to provide for the strongest points of “overlap” between the two. “We want these students to achieve their dreams, whatever they are,” Hollis said. Thomason said a limited “pilot” class might be possible in the Fall, 2018; and he stressed the support which the plan has already received from the head of the U of A System. Responding to questions from both boards, Thomason and Hart emphasized their understanding that the program is designed for 16, 17, 18-year old students to take on college-level academics. Hart said the core of the academy obviously comes from the HAPS, YMS, and HHS campuses. He emphasized that the collegiate and professions programs which make up the academic DNA of UAHT from its days as Red River Vocational-Technical College provide a practical balance and continued affordability.